So begins one version of the ballad ‘Bold William Taylor’ in which William leaves Lichfield to go and fight a war. Sarah doesn’t get on well with her parents and so decides she too will become a soldier in order to be reunited with her true love. She disguises herself as a sailor but after suffering a wardrobe malfunction aboard the ship she is working on, it becomes apparent to the captain of the ship that she is in fact a woman. Understandably curious, the Captain wants to know what she’s doing on board his ship and Sarah explains that she’s there looking for her lover. The Captain gives her the devastating news that William Taylor has gone off and married a rich young lady but tells her that if she rises before the break of day she’ll find him out walking with his new wife. Sarah does just that and, on spying the happy couple together, calls for a sword and pistol and shoots William dead. In this version, the Captain is so impressed he puts Sarah in command of the ship and all his men. All’s fair in love and war? There’s a great performance of the song by Jim Moray here on YouTube. As I’m quickly discovering, establishing the origins of folk songs and ballads is nigh on impossible. It seems this may have originated in Lincolnshire but why Lichfield was chosen as the home town of the unhappy couple is a mystery and to confuse matters further, in some versions, Lichfield isn’t mentioned at all. Of course, I wanted to know if there were any more songs or ballads that mentioned Lichfield. I found that the Bodleian Library has a huge, searchable archive of over 30,000 broadside ballads. According to them, ‘Broadside ballads were popular songs, sold for a penny or half-penny in the streets of towns and villages around Britain between the sixteenth and early twentieth centuries. These songs were performed in taverns, homes, or fairs — wherever a group of people gathered to discuss the day’s events or to tell tales of heroes and villains’. I was really pleased to find that the collection includes several political ballads relating to Lichfield elections in the eighteenth and nineteenth century. The above lines come from a sheet dated 1799 (it has the year handwritten on it). However, this can’t be right as on the same page is the story of Sarah Westwood, a Lichfield woman was executed for murdering her husband, a nailer from Burntwood, in January 1844. If you want to read the full story of the case it’s well documented elsewhere, especially as Sarah was the last woman to be executed at Stafford Gaol. The inclusion of scandals and sensations such as this, along with the songs have led to many describing them as the tabloids of their day. You can search the Broadside Ballad archive yourself here. As I’ve said before, we often focus on the visual changes of places, but the sounds change as well. 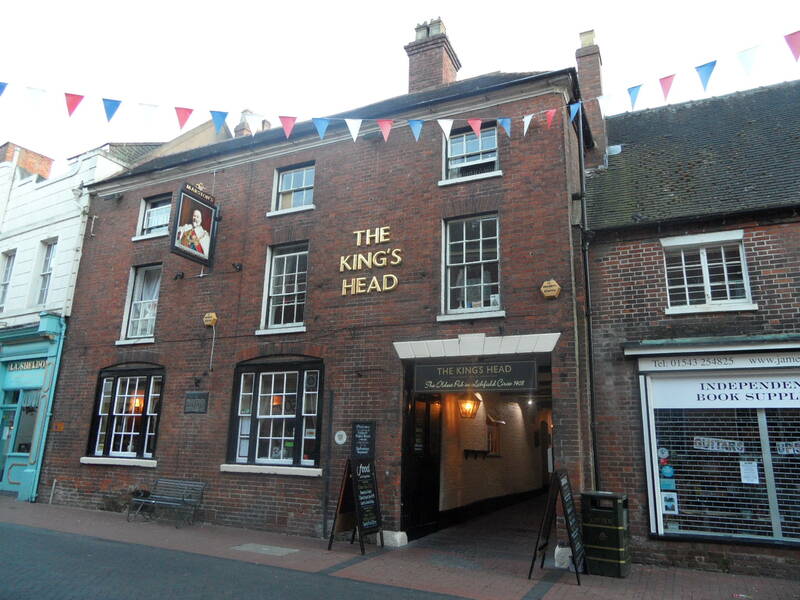 I’m thinking that with its mixture of traditional songs, contemporary folk songs, drinking songs, ballads, humour, monologues and poems, the Folk Singaround at the King’s Head looks like a great way to get an idea of what our pubs may once have sounded like and hope to get down there for one of the sessions soon. 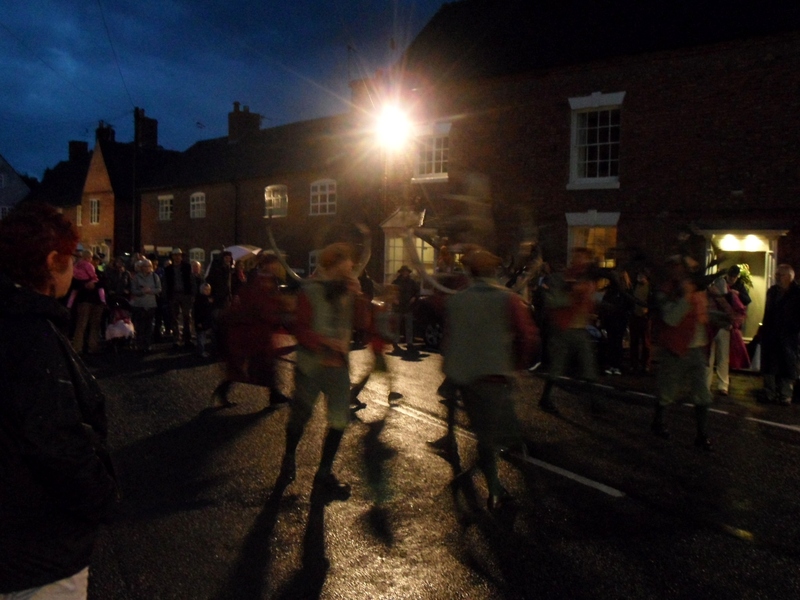 Hot on the hooves of Lichfield’s Sheriff’s Ride comes another ancient Staffordshire tradition – the Abbots Bromley Horn Dance. No one knows just how ancient though. The earliest written record of the dance seems to be from Dr Robert Plot’s ‘Natural History of Staffordshire’ in 1686, yet the reindeer antlers themselves have been carbon dated to around one thousand years ago. The Horn Dance c.1900. Apparently the splendid costumes are a Victorian invention. The original costumes were made by the vicar’s daughters from old bed curtains! The latest set of costumes were created at the turn of the millenium. On the subject of costumes, I love that the man dressed as a woman is wearing his shirt and tie beneath his! In ‘England in Particular’, the authors describe the dance as both unsettling and reassuring. I know what they mean. What you’re watching has a significance that is no longer makes much sense to our modern eyes, its symbolism like some long forgotten language. Yet there’s also something very British and familiar about the occasion in the scout tent set up over on the green, selling curry to the beer drinking crowds chatting together beneath umbrellas. If this is a pagan fertility ritual, it seems to get along well with Christianity these days. The horns are kept in St Nicholas’s church for 364 days a year, and before the horns are taken out on their annual excursion around the village there is a short blessing. The dance is performed outside the Abbots Bromley throughout the year but I understand that a second set of horns are kept for this purpose, these original horns never leave the village. There is a great story in a book on the dance by Jack Brown of the English Folk Dance and Song Society that I bought from the Oxfam bookshop. 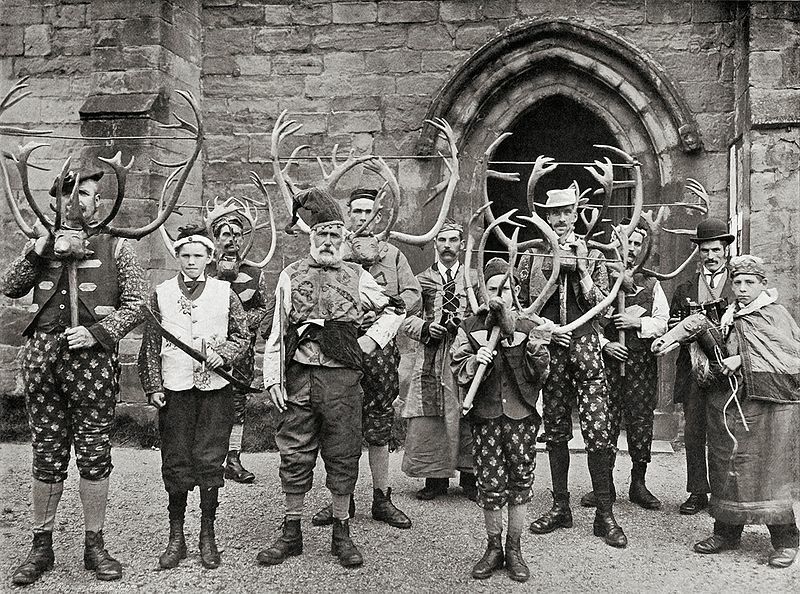 Apparently, in the 19th century, the dancers took a set of elk horns dancing in Burton and having consumed quite a lot of rum, managed to lose them. 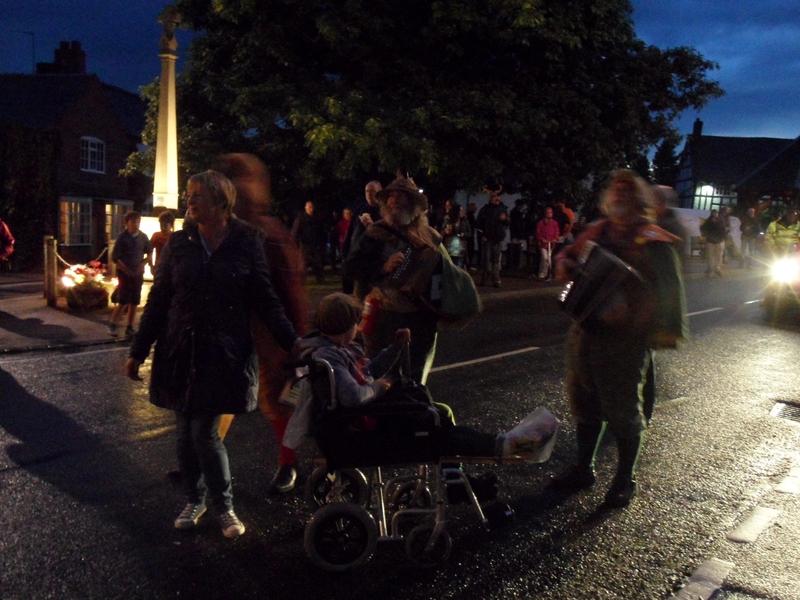 Some say the horns were stolen; others say the dancers decided they were too heavy and deposited them into the River Trent so they didn’t have to carry them all the way back to Abbots Bromley! It’s fantastic to have such a unique tradition taking place just ten miles or so up the road from Lichfield and although I’ve popped a few (rubbish) photos on here to give you an idea, it goes with out saying that there’s nothing like going along and experiencing it for yourself. So, put it in your diary for the next Monday after the first Sunday after the fourth of September 2014! Note – I could claim that the blurriness of the dancers and musicians on the following photographs is an artistic statement on the passage of time or something, but in actual fact they’re just really BAD photos! Anyway, the chap with furry antlers is on one of them which warrants its inclusion.